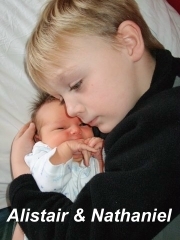 First – and most important of all, we welcome our new grandson, Nathaniel, to our growing tribe. Lauren and her partner Tony are thrilled to pieces, as are Imogen, Alistair and Rebecca! He is absolutely beautiful and as Lauren say, after the other three, a happy and very good, very easy, baby, and also it was Isabella’s first birthday on the 13th March. So a lot of celebrating. The last few months have been busier than ever both at home and with Roger’s music, with an enormous amount of excitement. The biggest news is that Roger will be touring in Scandinavia and possibly England (only a few dates) in October this year and then Germany in January, February and March 2009. The Germany and Austria are now posted on the website under Concerts. However the really big new is that apart from the new German album "Liebe endet Nie" ( now out ), we are busy preparing an English language TV advertised (Internationally) 40 track compilation, across the decades….because this autumn sees Roger’s 50th anniversary as a professional entertainer. As you can imagine there are all sorts of special celebrations and TV appearances. There is also plans in mind to re-release "Magical World" the children’s album (and possibly the "Whistling around the World") on ‘special products’ but nearer the time I will let you know how to order or buy these. There will also be an anthology double album, in different outlets. It has been very difficult to sort out the most requested songs, that are no longer available generally, so I have a few weeks to add any that haven’t been suggested on the Guestbook. SO ANY SPECIAL REQUESTS! Send them straight to Vicky and Rory (Tembo@Canada.com) – just one line with your most wanted song, and I will try and get them included. However time is short so please, as quickly as possible. I can’t guarantee all your requests will be granted but I will try and include as many as possible. All these English language CDs are being released through Universal, and if these are successful, we are hoping to release a double album early in 2009 of the "Lost Songs of Roger Whittaker" as many of the last albums never really got promoted in many, many countries. So again, if you have any very special songs from the last 12 years that you would like to see combined together, do let me know. I would really be happy if I can get re-releases on so many of the French titles that were so successful in the 70s/ 80’s but I have included some in the anthology compilations. For all our wonderful German, Austrian and Swiss friends, "Liebe endet Nie" is now out, and Roger is going backwards and forwards, doing TVs, interviews and videos. The next big TV with be with our friends Florian Silbereisen on the 5th April, and the Marianne & Michael in June. 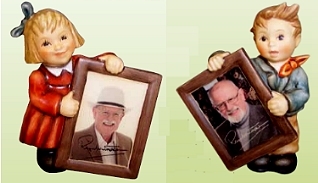 One beautiful thing that has happened is that Hummel figurines are offering for sale a limited and exclusive Roger Whittaker set of their collectable porcelain figures. The new models will of two of their adorable children, each holding an original signed photo of Roger in their hands. Wonderfully, they wanted to donate 10% of the profits from the sale of these figurines to charity – so Roger immediately suggested the Isabella Fund, which helps the Kenya Children’s Home Orphanage in Nairobi, Kenya. 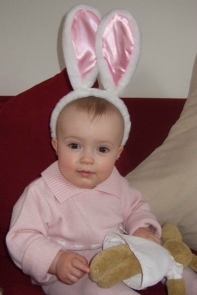 Roger helped to set up the fund this year to celebrate the first birthday of our darling granddaughter, Isabella. In view of the terrible times Kenya has recently endured, loving, caring institutions like the KCH need as much help as possible with the hundreds of orphans for whom they provide a safe, and happy childhood. All orders and donations will be handled by Hummel – so please don’t ask us for details – and order forms will be included in the booklet of the Liebe endet Nie album. For more information about the Kenya Children’s home, see www.kenyachildrenshome.org.uk and for Hummel, see www.goebel.de. We hope to be able to have samples on the tours, with order forms, for anybody who does not know of our website!!! 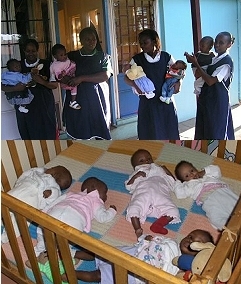 The Kenya Children’s Home actively looks for adoptive parents for the orphans in its care. All the Whittakers hope that the same joy little Isabella brings us will be shared by the very special families lucky enough to give a home to these amazing children in Roger’s beloved homeland. This May, we have, of course, the wedding of Jessica (our youngest daughter) and James Brabazon – Isabella’s parents – in the UK. We are also looking forward to the release later this year, of an extremely special Roger Whittaker biographical film production on DVD, which includes family footage, and glimpses of Roger aged 10, as well as many old TV out-takes across the decades. Some time in the summer months we will also be filming another Special for German TV to go out around his 73rd Birthday next year. With all this hive of activity, I have to type Roger new schedules every week! And for myself and the children. The whole family will be over in late July or early August for a Whittaker Tribal Get Together! I am having to rent holiday cottages, as with the arrival of Nathaniel we now total 19 - and I am desperate to finish the conservatory which will hold a table for 24……If Guy and Mette, Jessica, James, and eventually Alex, increase the tribe, we will need a kids side table as well! We have cots, high chairs, and playpens all over the place – in France, as well. Talking of Guy and Mette – they are off on holiday to India next week – a well deserved rest for them both. Guy has been touring all over Europe with the FINK trio and gaining more and more support for their music. Their third CD will be out later this year. Alex has just had a hugely successful exhibition of his paintings. I am nagging him to get an agent and start showing his art, here in Ireland, as well as the UK. Emily and Stewart moving house, and we are going to be celebrating again in May as Emily turns 40! Sorry Emily) I can’t believe it…. How the years have flown by! It is so lovely reading some of your letters in the guestbook, where you give me stories of how many of you found Roger’s music and now your own children are discovering his work. Putting together the anthology album and the biographical DVD actually made me quite sad at how fast time has flown. Equally, though, it made me remember so many incredible, funny and happy moments that with the passage of time and pressure of Roger’s hectic schedule, had faded from memory. So it has been a great experience and I really hope all of you will enjoy the end results. When everything is’ ready to go’, details of how to order will be up on the site. Roger is in very high spirits with all this, He too had forgotten that it was 50 years since he started this crazy life of entertaining. As for me – as you can imagine I hardly get a moment to myself right now! Flying to the UK and France for 5 days every month, is pretty exhausting, and I can tell you that all the delays and new airport rules and regulations don’t half make life difficult! Years ago I suggested to Roger that I write a silly book called "Airlines I have Known", and "Hotels I have known" etc., ad infinitum – I’ve got more than enough material, I can tell you., - but seriously as soon as Roger has finished his German tour, I am going back to writing the books that are both half finished ! The cook book that was commissioned nearly 22 years ago, Can you believe) and the next Roger story from 1982 onwards. My Irish family also want me to do a "Factional" book (a mixture of fictions, and fact) about my grandparents and Great grandparents lives in India, my Father’s life and our lives to the present day. I say "Faction" because a lot of the stories are really family myth with little to back up the wild and wonderful tales of my clan, except for the earnestness with which they are told! I don’t think the word ‘retirement’ is in my vocabulary for the next few years…..I just need the time to get on with it all…certainly not this year! So with wishes for a ‘blossoming’ and beautiful Spring, and to a long and sunny summer, I send you all very best wishes, and keep the letters coming…. We love them. Thanks as always to Vicky, Rory and all those who make this web site such fun. Natalie, Roger and the ever increasing tribe!